In the religion of the Mayas of Yucatan the great god of light was Itsamna, one of whose titles was The Lord, the Eye of the Day, a truly picturesque description of the sun. A temple at Itzmal was consecrated to him under the double name Eye of Day-Bird of Fire. In time of pestilence, people resorted to this temple, and at high noon a sacrifice was spread upon the altar. The moment the sun reached the zenith a bird of brilliant plumage, but which in fact was nothing else than a fiery flame shot from the sun, descended and consumed the offering in the sight of all, the Scarlet Macaw. The Macaw feathers were highly prized items for the pre-Hispanic peoples of Mesoamerica. They had a significant value in rituals, and economically and politically speaking. The colorful and iridescent feathers of tropical birds, especially of the Psittacidae family, were very important. The feathers promote the long distance trade and strategies, even breeding programs, in order to constantly supply feathers. During the 1500s AD, the Aztecs were receiving feathers as a polity tribute. The red, blue and yellow feathers of the scarlet macaw (Ara macao) were of particular interest. The species is associated with rule by shamans in the Itzapa, and the Classic Maya (250-900 AD) depicted the macaw in their culptures. 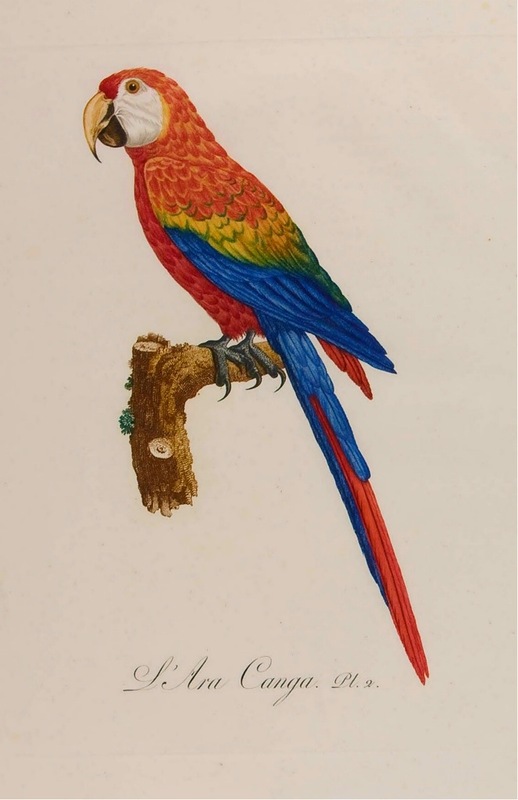 The Scarlet macaw feathers were the most used for feather working by the Aztec elite in their decorations. An beautiful Indian prince came to live with the earth people and in his hand he carried a plume stick. It was a magic wand with charms, red and yellow feathers. It was the magic wand which tests the hearts of earth children. Then amid the plumes and charms of the magic wand there appeared four round things. They are eggs!” cried the earth children. Two are blue like the sky. Two are red-brown like the dust. Now, said the strange prince, choose whichever eggs you will. From them will come birds such as you never before have seen. You who choose the blue eggs shall follow the birds which come from the blue shells. You who choose the red-brown eggs shall follow the birds which come from the red-brown shells. From one pair of eggs shall come forth beautiful birds. Their feathers shall be coloured, like the leaves and fruits of summer. They shall nest in the land of everlasting summer-time and plenty. Their food will come to them without labour and they shall know neither hunger nor cold. From the other pair of eggs shall come forth birds with black feathers, piebald with white. This pair will nest in a land where you may gain food by labour only. Those who follow this pair of birds shall struggle summer and winter. By long days of toil they shall provide food. Then those who were strongest and quickest pushed forward. They fought for the blue eggs, and getting them hurried away with gladness. They buried the blue eggs in the soft loam on the sunny side of the cliff. Now there remained those weaker earth children who had been pushed aside. The strange prince gave into their hand the red-brown eggs. The red-brown eggs were placed amid the soft green grasses by the riverside. By and bye, as those on the cliff waited, they heard faint tappings inside the blue shells. When at length the shells burst and the young birds came out, they looked much as other birds look. They had large mouths and panting sides and tiny featherless bodies. Soon the pin-feathers appeared. The red-brown eggs also were cracking open and the young birds coming out of the shells. Soon the earth children must follow their bird leaders. They fed and tended the young birds for still a few days. It was a pair of ravens, which the stronger earth children followed to the country where winter follows summer and where men work for food. As the earth children laboured, the ravens taunted them with hoarse, laughing cries. Now those other earth children who watched the red-brown eggs stood up by the riverside and smiled. From the red-brown eggs had come birds of gorgeous plumage with red and blue feathers, it was a Macaw. On the breath of a sweet-scented breeze they were wafted far to southward, to the summer land. And those earth children who followed the beautiful birds still live easily in the land of everlasting summer-time.